Advantech Web Access is a web browser-based software package for human-machine interfaces (HMI) and supervisory control and data acquisition (SCADA). All the features found in conventional HMI and SCADA software including Animated Graphics Displays, Real-time Data, Control, Trends, Alarms and Logs, are available in an standard web browser. Web Access is built around the latest internet technologies. SCADA Node: it communicates in real-time with automation equipment and controls the equipment via serial, Ethernet or proprietary communication via multiple built-in device drivers. Not only does it run local controls and monitoring, but also provides real-time data to all remote clients. Project Node: it is the development platform for Web Access and is a web server for all clients to connect to the development project or remotely monitor and control the system. All system configuration, project database files and graphics are stored here. Client node: through the ActiveX control inside Microsoft Internet Explorer, it monitors and controls the SCADA Node. The client connects to the Project Node and get the address of the SCADA Node, then communicates directly with the SCADA Node using proprietary communications over a TCP/IP connection. Data is displayed in real-time with dynamically animated graphics along with real-time, historical trending and alarm information. Users can acknowledge alarms and change set-points, status and other data. Mobile Client: the Mobile Client interface is intended for use with smart mobile devices, such as iOS, Android; and Windows mobile devices. In the mobile client users can browse graphics, data-log trends, and tag information in real-time. Set value to tag or acknowledge alarms can also be supported via an intuitive interface. 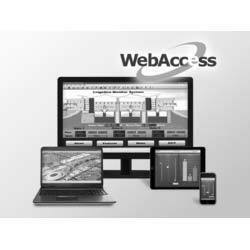 Web Access 8.0 releases a new generation of Web Access HMI. Business Intelligence Dashboard, provides users with cross-platform, cross-browser data analysis and user interface based on HTML5 technology. Web Access 8.0 can also act as an IoT Platform by providing open interfaces for partners to develop IoT applications for different vertical markets. Support ample drivers, including Advantech I/O, controllers and major PLCs. Incepted in the year 2010 at Ahmedabad (Gujarat, India), we “Lubi Electronics” are the reckoned Trader and Supplier of wide assortment of Programmable Automation Controller, Industrial Server, Remote IO Module, Industrial Workstation, Industrial Communication Device, PC Touch Panel, etc. The offered electronic products are sourced from certified vendors of the market who are known for their product quality since many years. Our offered products are designed and manufactured at our vendor’s end using finest grade components with the help of contemporary machines in compliance with set industry norms. The offered products are widely used for various purposes in industrial and residential places such as controlling, monitoring and calibrating electricity. These products are widely appreciated by our clients for their enormous features such as easy to install, compact design, low maintenance, less power consumption, anti corrosive body, shock proof cover and durability. Apart from this, we also provide Installation and Repairing Services of these products to our clients in effective manner.